We’ll have free Pabst Blue Ribbon until it runs out, free (and gluten-free) protein bars from thinkThin and free shirts from Etnies, so come early and often. 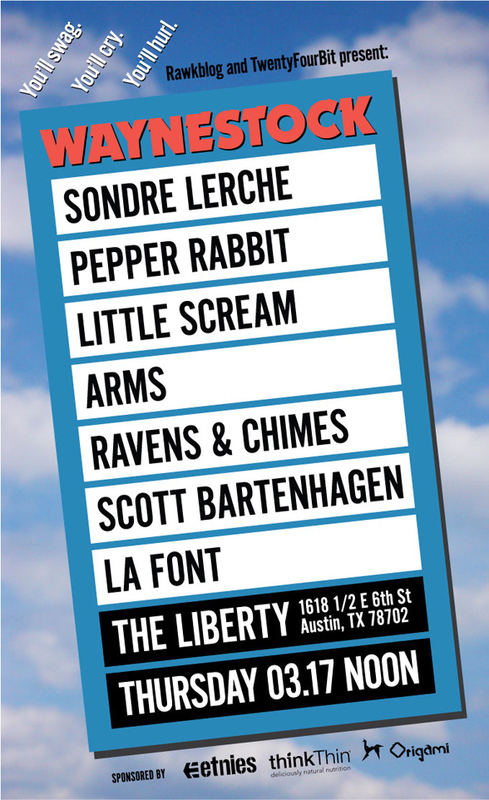 You can get to-the-minute updates at our official Twitter page, @waynestockSXSW, and RSVP on Facebook. We’ll obviously be covering the event right here and via @DaveRawkblog and @TwentyFourBit as well. Take the jump for a free mixtape and more info on the bands playing. Scott Bartenhagen: The California songwriter will be making one of his debut full-band performances at Waynestock, during which Sam Beam and Sufjan Stevens will hoist him on their shoulders and proclaim him the new king of indie-folk. Or you guys can, either way. Ravens & Chimes: After releasing the urgent, excellent debut The Reichenbach Falls in 2007, New York chamber-rockers Ravens & Chimes are set to return with the accomplished sophomore effort Holiday Life. This is the most exquisitely heartbroken you’ll feel all week. Sondre Lerche: The Bacharach-influenced Norwegian-turned-Brooklyn-based songwriter will be previewing tracks from his to-be-announced follow-up to the stellar Heartbeat Radio, which may include his Mondrian-debuted serious jam “Private Caller” (above).